Home » Type » Static » Moderna de pueblo: Capullos Everywhere! Moderna de pueblo: Capullos Everywhere! 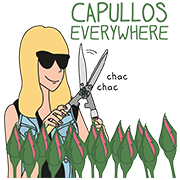 http://www.line-stickers.com/ – Moderna de pueblo: Capullos Everywhere! Line Sticker | Some people are allergic to pollen, some are allergic to fools. If you fall into the second category, these stickers are for you! Name LINE Sticker: Moderna de pueblo: Capullos Everywhere!